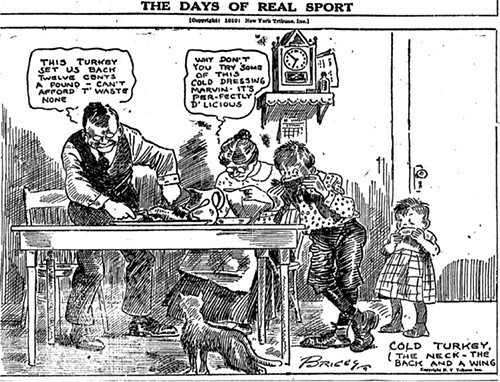 Atlanta Constitution, December 1, 1919. What would Thanksgiving be without jokes about turkey leftovers? Personally, mind you, I've never seen such a thing as too much turkey: As long as it lasts, I'm happy to re-purpose the surplus as turkey sandwiches, turkey pot pie, turkey noodle soup, turkey sorbet, whatevs. This sweet cartoon is fairly representative of the work of Clare Briggs, who's up there with H.T. Webster and John T. McCutcheon as an early comix genius ripe for rediscovery. I love the face on that little dude in the baby dress.